During 1995 we experienced many commemorations marking the 50th anniversary of the end of World War II. For those of us who are veterans of this terrible conflict, these commemorations have been times of thoughtful reflection. It is interesting what memories stay with us year after year, long after the historic event happened. For example, while I was watching a recent TV documentary on the war, suddenly into my mind came an old green footlocker. Let me explain why the green footlocker left such an indelible impression on me. As I entered the mission field, I was blessed to be assigned to a very special senior companion. We had the privilege of laboring together for almost a year before a transfer occurred. With World War II raging, we knew at the end of our missions we would soon be called into military service. We both agreed that when we returned home we would try to enlist in the navy and hope that somehow our paths might cross as we served. Much to our surprise, on the first Sunday as marines, we ran into each other at a Church service. Both of us had volunteered for the Marine Corps! When we completed our boot camp, we were both assigned to the Second Marine Division and were blessed to have our companionship last nearly three more years. After the battle was over on the island to which our division was assigned, we were able to obtain a tent for our Church services. We made benches, a pulpit, and a sacrament table out of any piece of lumber we could find. Under the sacrament table we placed that special green footlocker. The footlocker was carried from island to island as the Second Marine Division completed its orders. The contents included a wooden plate, a wooden sacrament tray, a card containing the sacrament prayers, and several boxes of small paper cups. When the battle was over and the island secured, many of the veterans in our division were rotated back home, including our Church leadership. 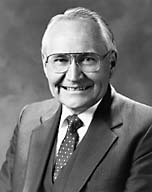 My missionary companion was sustained as our group leader, and I was called to be his first assistant. The contents of the green footlocker represented all we held dear. As we gathered each week on the Lord’s day, opened our footlocker, and used the contents to prepare, bless, and pass the sacrament, it was a spiritual and uplifting experience that renewed our faith and gave us hope for the days ahead. That special hour together each week removed us from the trials and hardships of everyday life. Even though the island had been secured, air raids continued. Soon our tent chapel was filled with many holes caused by shrapnel tearing through it. Because of the frequent tropical rains, it was uncomfortable to sit in a tent with so many holes in it. We determined that our meetings deserved better quarters, and through the efforts of the members of the Church from the marines, the army, the navy, and the air corps we were able to obtain enough material to construct our own chapel on the island. Now the green footlocker was placed beneath the table in a dedicated building where we could meet and worship together. When our duties on the island were complete, we boarded a ship and moved on to another assignment. Our green footlocker remained in the chapel for others to use. I don’t know its final destination, but I will always fondly remember that green footlocker. Our Father in Heaven understood the need for his children to be reminded of the promises He has made to us if we would obey his laws. In making such covenants, the Lord offered blessings in exchange for obedience to particular commandments. A plan was laid out for us from the very beginning. The central figure in his plan of salvation is our Lord and Savior, Jesus Christ. His atoning sacrifice for all mankind is the centerpiece of the history of our Father in Heaven’s children here on earth. Each of us who accepts the divine plan must accept the role of our Savior and covenant to keep his laws that our Father has developed for us. As we accept Christ in spirit and in deed, we may win our salvation. We read in the scriptures: “Wherefore, thou shalt do all that thou doest in the name of the Son, and thou shalt repent and call upon God in the name of the Son forevermore” (Moses 5:8). “And he gave unto them commandments, that they should worship the Lord their God, and [they] should offer the firstlings of their flocks, for an offering unto the Lord. And Adam was obedient unto the commandments of the Lord. “And after many days an angel of the Lord appeared unto Adam, saying: Why dost thou offer sacrifices unto the Lord? And Adam said unto him: I know not, save the Lord commanded me. “And then the angel spake, saying: This thing is a similitude of the sacrifice of the Only Begotten of the Father, which is full of grace and truth” (Moses 5:5–7). From that time onward until the Savior came to earth, whenever the priesthood was present, man offered sacrifices to remind him of the time when the Son of Man would come to earth to make the supreme sacrifice for all of us. “… this is my blood of the new testament, which is shed for many for the remission of sins. “But I say unto you, I will not drink henceforth of this fruit of the vine, until that day when I drink it new with you in my Father’s kingdom” (Matt. 26:26–29). President Joseph F. Smith said this of the institution of the sacrament: “It was instituted by the Savior in the place of the law of sacrifice which was given to Adam, and which continued with his children down to the days of Christ, but which was fulfilled in his death, he being the great sacrifice for sin, of which the sacrifices enjoined in the law given to Adam were a similitude” (Gospel Doctrine, 5th ed. , 202). Shortly after Joseph Smith and Oliver Cowdery received the priesthood from heavenly messengers in 1829, they were shown in revelation how they should proceed to organize the Church again on earth. Doctrine and Covenants 20 gives the reason for this specific date: “The rise of the Church of Christ in these last days, being one thousand eight hundred and thirty years since the coming of our Lord and Savior Jesus Christ in the flesh, it being regularly organized and established agreeable to [all] the laws of [the] country, by the will and commandments of God, in the fourth month, … on the sixth day of the month which is called April” (D&C 20:1). Peter Whitmer Sr. offered his home for the organization that was scheduled for Tuesday, April 6, 1830, in accordance with previously received revelations. At the appointed hour, somewhere around 60 people assembled to witness the formal organization of the Church of Jesus Christ. The meeting was simple. Joseph Smith, then 24 years of age, called the group to order and designated five associates﻿—Oliver Cowdery, Hyrum Smith, Peter Whitmer Jr., Samuel H. Smith, and David Whitmer﻿—to join him to meet New York’s legal requirements for the incorporation of a religious society. After kneeling in solemn prayer, Joseph asked those present if they were willing to accept him and Oliver as their teachers and spiritual advisers. Everyone raised their hands to the affirmative. Although they had previously received the Melchizedek Priesthood, Joseph and Oliver ordained each other to the office of elder. They did this to signify that they were elders in the newly organized Church. The sacrament of the Lord’s Supper was administered next. The Restoration of the gospel clarified the use and meaning of the sacrament, which, through dark periods of the Apostasy, had suffered many perversions. By revelation, the members of the Church were counseled, “It is expedient that the church meet together often to partake of bread and wine in the remembrance of the Lord Jesus” (D&C 20:75). With the partaking of the sacrament, we accept Jesus as our Lord and Savior and obligate ourselves to keep his commandments by covenant. This makes the partaking of the sacrament a renewal of the covenants we made at the time of baptism into the Church. Thus, by the sacrament, we declare repeatedly, ordinarily weekly, our allegiance to the plan of salvation and its obligations and blessings. “For he that eateth and drinketh unworthily, eateth and drinketh damnation to himself” (1 Cor. 11:28–29). President Brigham Young, speaking of the sacrament, said, “Its observance is as necessary to our salvation as any other of the ordinances and commandments that have been instituted in order that … people may be sanctified” (Discourses of Brigham Young, sel. John A. Widtsoe , 171). “My brethren and sisters, do we always stop to think, on that sacred Sabbath day when we meet together to partake of the sacrament, that we witness, promise, obligate ourselves, in the presence of one another, and in the presence of God, that we will do certain things? Note them. “The first: We are willing to take upon ourselves the name of the Son. In so doing we choose him as our leader and our ideal; and he is the one perfect character in all the world. “Order, reverence, attention to divine promises﻿—the promise to enter into the fold of Christ, to cherish virtues mentioned in the gospel of Christ, to keep them ever in mind, to love the Lord wholeheartedly, and to labor, even at the sacrifice of self, for the brotherhood of man﻿—these and all kindred virtues are associated with the partaking of the sacrament. It is good to meet together and especially to renew our covenants with God in that holy sacrament” (Gospel Ideals , 146–47). That old green footlocker will always have a special place in my heart because even in one of the most trying periods of my life, I was able to receive spiritual renewal for the days ahead as I would partake of the sacrament of the Lord’s Supper. Over the many, many years as I have had the privilege of attending sacrament meetings, whether in times of peace or conflict, periods of joy or sorrow, periods of stress or relative ease, partaking of the sacrament has been a time of thoughtful reflection on the blessings the Lord has given to me and a time to covenant with him to live closer to his law and his gospel. I encourage each of you to be faithful in your attendance at sacrament meeting. The Lord has promised that if you will partake of the sacrament worthily, he will bless you with the peace of mind that can only come from knowing that you are participating in his divine plan. I also promise each of you that you will receive the special blessings he has promised you here on earth and in the eternities to come, according to your faithfulness. This is my witness to you in the name of our Lord and Savior, Jesus Christ, amen.